If piano concertos, as a genre, were invented as a means to express dissent and argument between a soloist and accompanying orchestra, those of Mozart are among the most congenial. The F Major concerto (premiered in 1784 in honor of the Frankfurt coronation of Emperor Leopold II with Mozart himself at the piano) combines lyricism and athletic keyboard ability. Thursday night at the New York Philharmonic proved that in their familiar roles of conductor and pianist, Sir Colin Davis and Mitsuko Uchida have both to spare. In the opening movement, the veteran conductor built Mozart's six-theme architecture, setting the stage for the entry of the piano part. Then, Uchida lifted her hands, settled them just at the keyboard and poured forth torrents of notes with seemingly no effort. She produced a quicksilver stream of sound, her fingers flying up and down the keyboard. The adagio movement was woven from the same silver cloth, the minimal accompaniment complementing the flow of sound from the piano. The final movement was far more athletic, but no less thrilling to the ear. The concert opened with one of the better-known Haydn symphonies: La Reine (named after Marie Antoinette, who particularly liked it) belongs to the set of "Paris" symphonies (Nos. 82-87). This symphony (No. 85) finds Haydn absorbing French influences, incorporating themes and musical devices designed to appear specifically to French musical tastes. The second movement of this symphony includes a charming theme-and-variations on a folk-song called "La gentile et jeune Lisette". Employing a minimal force, Sir Colin conducted a robust performance of this elegant little symphony, a refreshing change from the massive works that are staples of this orchestra's repertory. The finale was Schubert's Fourth Symphony, returning to the Philharmonic repertory for the first time since 1996. Despite its nickname (given by the composer), this "Tragic" Symphony has far less pathos than one might expect. It does have Schubert's unerring sense of melody, building off the symphonic ideas put forth by Haydn, Mozart and Beethoven. The slow movement featured a lyrical oboe solo from principal Liang Wang. The scherzo with its dotted rhythms and off-the-beat introduction held no terrors for the veterans of the Philharmonic. The final rondo featured a conflict between a bouncing little theme and a sighing figure in the strings--no doubt the tragic inspiration coming out in this otherwise sunny work. 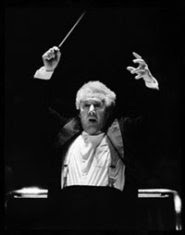 Above: Sir Colin Davis makes the conductor's sign for "touchdown." Die Ägyptische Helena at the Met. Love conch-ers all: Deborah Voigt and friend. Photo © 2007 The Metropolitan Opera. 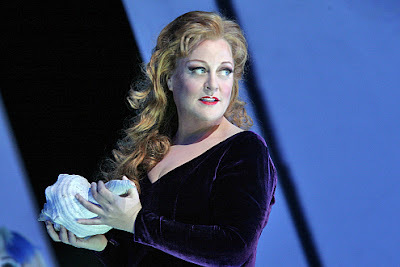 On Monday night at the Met, Deborah Voigt gave an incandescent performance in the title role of Richard Strauss’ Die Ägyptische Helena. Her supple soprano sailed through this supremely difficult part with ease, navigating a score that is so difficult that it is either cut heavily or simply not performed. To his credit, Fabio Luisi led a completely uncut version of the score. Ms. Voigt, who recorded this work in concert with Leon Botstein and the American Symphony Orchestra, sliced through the rich orchestral fabric, ably conducted by Fabio Luisi, with ease and grace. This might be the soprano's greatest triumph in a long Met career that has included Aida, Sieglinde, and will soon lead to Minnie and Brunnhilde. In this opera, Strauss wrote not one, but two killer soprano parts. The other is that of the sorceress Aithra, wife of Poseidon and Queen of the Sea. German soprano Diana Damrau proved an able foil to Ms. Voigt, matching her note for note. The two voiced blended in the duets, producing that trademark Strauss sound of divas in full flight over an ocean of strings and brass. Ms. Damrau acted this challenging part with humor--her Aithra is a cross between all-powerful sorceress and spoiled trophy wife. Interestingly, her husband Poseidon was added to the action as a mute part, an effective dramatic device. As Menelaus, tenor Michael Hendrick (replacing an indisposed Torsten Kerl for yet another performance) coped well with one of the most unlovable parts in opera. If Strauss wrote lovely, if difficult parts for his soprano leads, he was downright sadistic to his tenors. Menelaus is cursed with a difficult high range, and a generally unlovable role in the drama. Hendrick struggled to get over the orchestra in the second act. But for the most part, he proved a serviceable heldentenor, and his acting proved that the Metropolitan Opera believes in thorough coaching for its backups. The tenor star of the evening was Garrett Sorenson as Da-ud, who made his character's all-too-brief scene an exercise in melodic singing. David Fielding’s new production of Helena solves many of the opera’s problems. Intelligent decisions can be seen in this staging, imported to the Met from the Garsington Opera. He created fresh ideas and solved many of the opera’s problems, including the chorus of elves and the giant singing seashell in Act One. That latter character, described in the libretto as The Omniscient Mussel and usually voiced by an offstage actress, is this work's biggest dramatic liability. Instead of some large, ugly prop out of “Little Chip Shop of Horrors” or an undersea version of Fafner from Siegfried, this staging presented the singing shellfish as contralto Jill Groves. Wearing a black body-stocking, she stalked the stage like a Greco-German ninja: a walking shadow carrying a conch shell. That shell was a crucial prop--at the climax of the opera Menelaus and Helen drank the magic potion from it to resove their marital woes. The entire setting was on a raked stage with two massive doors that opened and closed to reveal Menelaus and Helen's wedding bed as well as various aspects of the natural world--the oceans under Poseidon's sway and the deserts of North Africa. Combining those visuals with a study in the use of gels and colored lighting, Mr. Fielding created a rich visual palette that sustained the dramatic interest without succumbing to the unfortunate baggage (i.e. the mollusc) that has dragged down this opera since its 1928 premiere. One only hopes that the success of Strauss' Helena in this production will lead New York's biggest opera houses to blow the dust off other ignored Strauss masterpieces: Daphne, Die Schweigsame Frau and Die Liebe der Danae. Dear Reader: Wagner Veek got interrupted by a cold (achoo!) so keep reading next week for my reviews of the Met's Die Ägyptische Helene, the New York Philharmonic, and the DVD of Götterdämmerung from the Liceu in Barcelona. All good stuff to look forward to! Without any further delay or to-do, heeere's SIEGFRIED! The theme of environmental decay continues in the third installment of Harry Kupfer's Barcelona staging of his second Ring cycle. Mime's lair is a massive underground factory floor, complete with a giant wind-powered forge. Siegfried, ever the environmentalist, shears the blades off the propeller at the end of the first act--a welcome change from the usual splitting of the anvil. The World-Ash is still present, a huge hollow log suspended above the stage which Wotan (Falk Struckmann) sometimes uses as a lofty perch. There are less theatrical echos from the director's 1988 cycle here--one feels that more thought went into re-thinking this most difficult opera for this production. In the title role, John Treleavan has a fine, ringing tenor, sailing through the soft passages and rising to meet the vocal brutalities of the Forging Song. His Siegfried is a burly bully, playing obnoxious, often uncomfortable pranks on Mime and physically abusing his step-parent. But his voice starts to fray in the end of the second act, becoming tight and compressed. Treleavan fares better in the final duet with Brunnhilde, holding his own with some impressive, if strained high notes. Graham Clark reprises his Mime yet again, and that's never a bad thing in this difficult, unlovable role. The British tenor's voice is sometimes shrill, sometimes lyrical--perfectly suited to the role of Mime. His hyperkinetic Harold Lloyd acting style captures every slimy nuance of the character, and his scenes in Act II are both pathetic and hilarious. (My favorite moment is when he swipes Alberich's hat.) His death scene is a comic highlight with a bloody end--the dwarf actually gets the sword away from Siegfried (the whole plan to begin with) and then actually hands it back to his ward. Clark is a magnificent Mime, but so annoying that his death comes as something of a relief to the ears. As the Wanderer (Wotan, cleverly disguised by a grey fedora hat) Falk Struckmann gives his finest performance of this cycle, his voice settling comfortably into the deeper pitches of the role. Gunther von Kannen is as ever, firm and deep as Alberich, his opposite number. Andrea Bönig continues her terrific run through this Ring. In Act III, she appears as Erda, tangled in fiber optics, a victim of information overload. She is vocally solid, although her mezzo is a little light for Erda. The environmental theme dominate the forest scene of Act II. The World-Ash is now a hollow trunk that Wotan hides in, releasing the Forest Bird into the woods like a wind-up toy. Fafner (Erik Halfvarson) literally comes out of the forest floor but this dragon is more pathetic than intimidating. Halfvarson (who also played Hunding in the cycle's Die Walküre) appears in the mechanical cyborg outfit from Rheingold although casting him instead of Matthias Holle is confusing--a first-time viewer might think that Siegfried, trying to kill Fafner has accidentally offed Hunding instead. The most impressive visuals come in the final act, a near earthquake at the start of the Erda scene and an impressive rendering of the Magic Fire scene in its second iteration. As Brunnhilde, Deborah Polaski sings a beautiful Awakening scene. Her duet with Siegfried has both power and passion, and she copes admirably with the devilishly difficult high notes at the end of the final duet. Photos: (upper) Knuckle Heads: Graham Clarke as Mime counsels Siegfried (John Treleavan). All photos © 2004 Opus Arte. The second installment of Harry Kupfer's Barcelona Ring continues in the same bizarre vein as the first. Once more, effective use is made of the "grid" background, providing lighting accents and color during the second act. The tree-image is also crucial to this opera--Wotan' outburst of "Das Ende!" causes an enormous branch of the rotting wood to smash down onto the stage. For the "Ride of the Valkyries," the wall opens two Valhalla-sized doors, through which the diapered corpses of the dead warriors walk on their way to the afterlife. Falk Struckmann is a capable Wotan. While his baritone veers between dramatic darkness and resonant warmth, he compensates with some really good acting. With his ponytail and one-lensed Gargoyle shades, this is a wannabe God--more like a gang leader than a deity. He captures all of the character's inner conflict--it is when that conflict becomes public that Wotan shoots himself in the foot, ensuring his own doom by renouncing and banishing Brunnhilde. That said, his Farewell scene is poignant, and wonderfully sung, with the piano notes in place and a resonant warmth that is both welcome and necessary in the final scene of this opera. The dramatic chemistry between Struckmann's Wotan and Polaski's Brunnhilde is palpable and tangible--their final scene together is sexier than anything the Wälsung twins do in the first act. As Siegmund, Richard Berkely-Steele has his own strange bits of stage business to contend with. Most notably, the bizarre Annunciation of Death scene, in which Polaski's Brunnhilde smears cold cream (or greasepaint, or something white could have been yogurt or Cool Whip) over his face, neck and hair, presumably in preparation for the afterlife. For one moment, you ask if this is Pagliacci. His sister is sung by the capable soprano Linda Watson. whose path from abused housewife to raging bundle of hormones is one of the joys of this production. She sings well throughout the performance, almost outshining Polaski in "O Heiliges wunder." Erik Halfvarson's acting skills come to the fore in the unlovable role of Hunding. Halfvarson plays him as an abusive schmuck who deserves to lose his wife. The Icelandic singer colors the role splendidly with his sturdy bass. Lioba Braun continues her excellent Fricka--her big Act II duet with Wotan is one of the highlights of the long second act. Once more, Bertrand de Billy is able on the podium, although he has an annoying habit of slowing everything down for the big moments (like the first appearance of the "Siegfried theme" in Act III. Other than that, he produces a light, transparent texture for his singers to work with, and an effective balance in the pit. Photos: (right) Brunnhilde asleep in the Magic Fire scene. (left) Falk Struckmann (Wotan) and Deborah Polaski (Brunnhilde) share a family moment. © 2005 Antonio Bofill/Opus Arte. At the start of this Das Rheingold, Wotan (Falk Struckmann) appears on a mirror-black stage before the mighty World-Ash tree, and breaks off a branch to fashion into his spear. This act, which Wagner described (but did not stage) in Götterdämmerung starts what one might call an "environmental" Ring Cycle, a heavy-handed (though in some ways brilliant) staging of the operatic cycle in Barcelona, courtesy of German director Harry Kupfer. 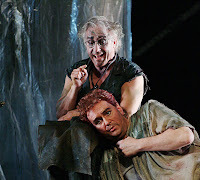 Kupfer has staged multiple Rings in this same post-apocalyptic manner since 1988--his superb cycle for Bayreuth has just been released by Rhino DVD. So is this new Rheingold (filmed at the Gran Teatre del Liceu in 2004) worth the time taken to watch it? The answer is, yes, if only to see what new wrinkles have been added to his "comic books meet Mad Max" style. Here, the action of the opera is set before a gigantic grating that looks like a cross between the Met's Don Carlos and Disney's Tron. Much of the opera features the heavy roots of the World-Ash, and the journey to Nibelheim is down an enormous plastic mineshaft--emblematic of the violation of the natural order which is a central theme to this production. In the pit, Bertrand de Billy gives a transparent, Boulez-style reading of the score that never lingers. He leads the Symphony Orchestra of the Gran Teatre del Liceu with a brisk, energetic style that is in keeping with this whole production's comic-book spirit. Gunther von Kannen reprises his terrifying Alberich, his cavernous baritone is in good shape here. His opposite number Falk Struckmann--who sings well enough but seems eager to expose the character's vulnerabilities. We never get a chance to like this Wotan before quickly learning what a jerk he is. His fellow gods sing well, particularly Lioba Braun as Fricka and Andrea Bönig as Erda. In a marvelous twist, Erda does not pop out of the ground, but pulls Wotan down to her subterranean cavern to address him like some mad Versailles dowager. Fasolt and Fafner brandish huge mechanical claw arms and catepillar treads like an operatic Transformer robot. But it's hard to love a robot, and where is the pathos in Fafner's transformation into a dragon if he starts the story as some kind of cyborg monster? Also, the singers seem "switched"--the harsher tones of Youn are better suited to Fafner. The more mellifluous, round-edged bass of Matthias Hölle would sound great singing Fasolt's "Freia" arietta in the second scene--something he did on the aforementioned Bayreuth version. Loge can often make or break a Rheingold and Graham Clark is terrific. Here he puts a fresh, maniacal spin on the fire-god. ne expects him to burn the theater down with his nervous energy. It is his job to look the audience in the eye at the opera's close, pulling the curtain shut as the egotistical Gods ascend into their new home, strewing confetti and glitter on themselves as they proceed to their eventual doom. Photos: (top) Falk Struckmann (center, with spear) directs traffic in a post-Apocalyptic Das Rheingold. 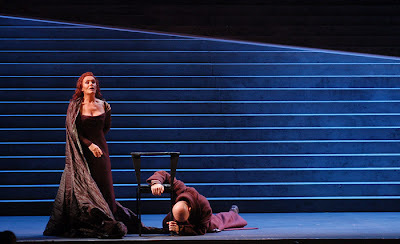 (bottom) Wotan (Falk Struckmann) is menaced by Fricka (Lioba Braun). Die Meistersinger von Nürnberg at the Met. Johan Botha as Walther von Stolzing. Image © 2007 The Metropolitan Opera. 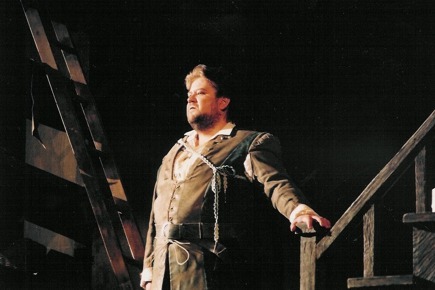 The Met's 2007 revival of Wagner's Meistersinger boasts a strong cast--maybe the best since Ben Heppner, Karita Mattila and Hermann Prey took the stage together almost ten years ago. As Sachs, James Morris' warm bass-baritone has worn a little over the years--the top is not quite as sweet as it was. He gets through the third act by taking repeated pulls on a tankard that sits on his cobbler's bench. But he recovered beautifully for the final scene, singing with gentle humor in the first act, meaning in the second and real pianissimo and emotional weight in the final scenes of Act III. His monologues were dead-on, and the cobbling song was (as it should be) a riot. The star of the evening was the town clerk. Hans-Joachim Ketelsen played Beckmesser as a vibrating bundle of nerves, a man who drives himself further and further into the ground--Wile E. Coyote to Sachs' shoe-making Road Runner. And yet, he hit the big high note at the end of the Act III "argument" scene dead-on, and engaged in inspired comic business in the big scenes in Acts II and III. Medieval musical torture has never been so much fun. Wagner is one of my passions--and this week is my only chance to go to a Wagner opera this season: tomorrow night's performance of Die Meistersinger at the Met. So this week, it will be all-Wagner, all the time here at Superconductor. Cosima would have been so happy! The week kicked off right with the review of Lohengrin and I am going to spend some time catching up on a DVD performance of Der Ring des Nibelungen that I haven't had a chance to watch yet: the OpusArte DVD set from Barcelona. This production is done by Harry Kupfer (same artist who was responsible for the Bayreuth "Laser" Ring of 1988--which is now available on DVD. Photo © 2005 Antonio Bofill/Opus Arte. Director Nikolaus Lehnhoff brings a fresh look to Wagner's famous Romantic opera in this bold production of Lohengrin, filmed in Baden-Baden with Kent Nagano on the podium directing the Deutsche Symphonie-Orchester Berlin. Yes, the usual silver and blue background is present, used by directors ranging from Wieland Wagner to Robert Wilson. But the stiff acting and slow pace that can bog this opera down (especially in the second act) are nowhere to be found. Rather, this is a nuanced performance--a Lohengrin of dramatic subtlety. Lehnhoff has chosen to set this opera in a repressive society. Everyone is in proper Ascot-style suits or military uniforms, except Lohengrin himself. Played by the exceptional young tenor Klaus Florian Vogt, the swan knight arrives without a boat, or even a swan. Rather, he's just another face in the crowd, one in an Italian cut, silver three-piece suit, matching tie, duelling saber and dorky helmet. Vogt is blessed with a fluid tenor that soars against Nagano's conducting, singing with the blend of nuance and power that is needed in this role. 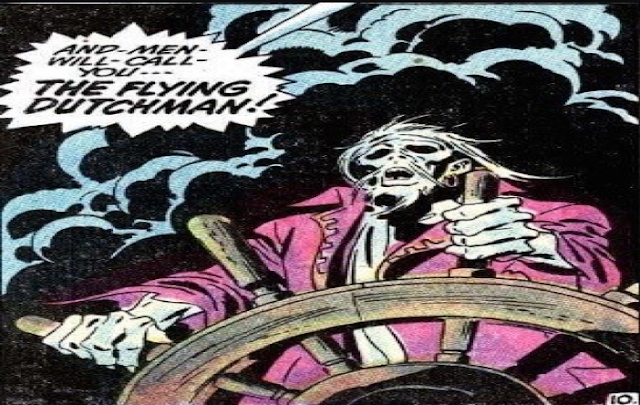 And he opens the pipes full blast for the big heroic moments, delivering a ringing "In fernem land," the opera's most famous aria. He is evenly matched by the superb Elsa of Solveig Kringelborn, a physical and vocal fit for this role--and a good actress.. Elsa is often reduced to a still figure looking anxious for three acts. Kringelborn throws herself into a physical, edgy performance that's uncomfortable for the audience--is this fragile girl is really off the rails in the first act? She grows and matures, however, as the opera continues. Although she is dominated thoroughly in Act II by Waltraud Meier's superbly bitchy Ortrud, she is a strong, even match for Lohengrin in the bridal chamber scene, and a picture of shattered isolation in the latter half of the third act. Speaking of that Act Three opening, the director chose to skip the usual "giant bed" and instead substitute a baby grand piano in front of a huge blue arris curtain. There, Lohengrin can be seen obsessing over the composition of the Bridal Chorus rather than paying attention to his brand new wife. This is a typical "male moment," and a funny comment on Lohengrin as the lone "creative type" in the repressive society of Wagner's Brabant. That society, is represented by a round, arena-like setting. With the simple drop of a curtain, the bridal chamber reverts back to the stadium set. Nothing fancy, and all the more effective in its simplicity. That famous married couple: the Telramunds are in the excellent hands of Waltraud Meier and veteran baritone Tom Fox. Neither is any stranger to Wagner--Fox has been recording since the 1960s, and Meier is the finest Kundry of the last 25 years. They rock the house in their Act II duet, with Meier channeling the great Wagner divas of the past, mixed with notes of Gloria Swanson and the Wicked Witch. And those dead-animal headpieces are just fabulous, darling. Hans-Peter König is a round-voiced, fatherly King Heinrich, Roman Trekel a stentorian Herald. The choral forces--so important in this particular opera--are brilliant. The DVD, directed by Thomas Grimm, successfully captures the characters' nuance and depth with solid editing and well-timed close-ups. Disclaimer: OK, dear reader. I admit it. I'm biased. I like Kurt Masur. I've interviewed him--an interesting man to talk to who is thoroughly passionate about music. And Masur was a formative conductor for me--the music director when I was completing my education and starting my professional career. In my Citysearch days, the New York Philharmonic was the first NY arts organization to give me a leg up (read: free tickets and press seats) so I've probably reviewed more Masur performances than any conductor except maybe James Levine at the Met. Hearing him conduct is for, this writer, a bit like coming home. It also might make me sound a bit biased in this review but *shrug* it's my blog so I'll gush if I want to. Kurt Masur returned to the New York Philharmonic last night, bringing his baton-less style back to the orchestra that he led from 1991 to 2002. On the program, a Mendelssohn overture, Sibelius' violin concerto, and Tchaikovsky's Pathetique Symphony, a work I know from records even though I'd never seen it performed in concert. Funny how you avoid works that are associated with tragedy and death, but no longer. The concert opened with a salty rendition of theHebrides Overture, a ten-minute evocation of the Scottish coast which is also known as Fingal's Cave. The Pathetique Symphony, (the title means "full of pathos", not "pathetic") premiered in 1893, nine days before the composer's untimely death. (He contracted cholera from drinking a glass of tainted water--no one knows if it was suicide.) This is his sixth symphony, a dark, programmatic piece, where the usual Tchaikovskian blend of ebullience and emotion is tinted in the key of b minor, keeping the proceedings grim throughout. In its bleak outlook, the symphony predicts the coming of Mahler and his heroic works--particularly that composer's own Sixth Symphony--the Tragic. This performance harnessed the raging torrent of the Philharmonic's famous brass section, particularly the trombones, led by Joseph Alessi and the horns led by Philip Myers. Special mention must also be made of the woodwinds--The introduction with bassoons and clarinets was marvelously played. The big romantic main theme from the first movement (which recalls the Act II "Flower Song" from Bizet's Carmen) soared on its own wings, contrasting with the raging central section of the movement. The two central dance movements were nimbly played, with that characteristic rhythm-snap that Masur brings to the podium. In the finale, the torrent ceased to a trickle of cellos, finally fading into nothingness.